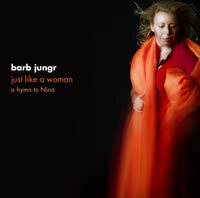 Barb Jungr's hymn to the late, great Nina Simone. This beautiful, haunting album combines Barb's compelling arrangements and resolute delivery to bring a fresh perspective on songs associated with her heroine Nina Simone. Nina Simone embraced utterly Louis Armstrong's understanding of music: "what we play is life" and, "my whole life, my whole soul, my whole spirit is to blow that horn." Nina sang and played with everything she had, and she took songs and inspiration from everything in her life and world. this was both her strength and her weakness, for that full commitment, that passion, is too strong a flavour for those of faint heart. I grew up loving Nina Simone; that uncategorisable voice, her uncompromising approach to material, fearlessness in changing lyric and arrangement to make songs personal, and courageous musicianship. so when i heard her spirit speak demanding that i make a collection dedicated to her, i complied without question. this is my ‘hymn to Nina'. The water flows to the sea, and when we stand beside that mighty river, it's easy to cry for all that lost love and time, easy to break down and let it all out. It's just like bob dylan to write a song as beautiful as this. There's a unique and near perfect relationship between lovelessness and drink that only the abandoned truly understand. and in this song there's also a supernatural aspect, that lilac tree is surely in a graveyard, the lilac flowers hanging over the lichen-covered stones as the clock of time ticks slowly, endlessly on. This song is as perfect today as it was when it was written, the sense for Nina of those changing times may have been different, but every word of this rings true, right here, right now. This song is the reverse of ‘maggie may', indeed it might be her song. such a simple song, with so much quiet depth. "I have thoughts like every other one", a very dark, dark song, velvet... and bloodstained. "When the fire is burning out and the angels call my name" i may still be singing this beautiful and true torch song. The Gibb brothers have written some stunning songs, and this has always been one of my favourites. These songs had to go together, and the pusher became a hymn all of its own suddenly, and it is about so much more than drugs. Why would a man kill all of his family and turn a gun on himself? As always Dylan reveals the reason by simply telling the story. "It's a new dawn, it's a new day, it's a new life". this is my 6th recording for linn records, but it feels like the first, somehow. "and i'm feeling good".